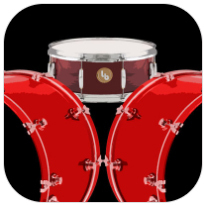 Looking for a killer Rock drum app for iOS? Well look no further. Turn your iPhone or iPad into a solid Rock Drummer with powerful drum sounds and tons of rhythms to get energetic drum grooves easily in a flash. The best drum machine for Rock. The new Live Pads lets to play live sessions on the way with 8 assignable pads and buttons for fills, intro, end with midi controls. And now, you can synchronize any app easily with Ableton Link. And the last addition in v5 is MIDI Out. Now you can catch any of the generated drum parts into any MIDI Sequencer to apply external sounds. Song Mode. An easy and quick way to make quality drums for your songs. NEW ability to improvise!!! Just move a slider to set the jamming level, now Rock Drum Machine seems human! * Edit Mode allows you to edit the whole rhythm quickly. * Patterns Mode allows you to set the patterns for each component (hihat/ride cymbal, snare or kick )easily with a wheel. Combine the best acoustic drum sounds with any rhythm to get top inspiring rocky grooves. * Midi Sync + Inter App Audio + Audiobus. You can stream live audio directly to other Audiobus or Inter App Audio compatible apps! * In Groove Edit Mode you can set any subdivision to any beats. Just long press on the time until it shows a red border and drag up or down to rest or add notes. EASY and QUICK!